Recently, we’ve noticed that old is new. Whether it’s in terms of fashion style, music or images, there has been a gradual shift towards nostalgia. We’ve been seeing a lot of people get into film, crossing tech and old-school analogue by uploading their film images on Instagram. However, nothing beats flipping through an actual photo album, just like how many of us prefer actual books to Kindles, despite the convenience. But if you love that 1:1 ratio that Instagram offers, we’re sure FUJIFILM’s new instax SQUARE SQ6 will be making its way to your camera collection soon. The simple and stylish camera comes in 3 colourways and a metallic finish – a clean Pearl White, an elegant Blush Gold and a chic Graphite Grey. The thing is, this polaroid camera is so much more than a regular polaroid camera. It has so many modes and functions that it’s almost like a simplified digital or analog film camera, making the SQ6 well adapted for any situation. With just a press of the shutter button, the automatic exposure adjustment function will detect the ambient brightness, automatically setting the shutter speed and flash light intensity so that you get perfectly exposed images every single time, even in low-light settings. Alternatively, you can adjust the exposure to either Bright, Standard or Dark, to suit your preferences, or just go natural with the Flash Off Mode. We admit that we’ve struggled to take a selfie without a front-facing camera or a flippable screen. Basically, if we can’t see our faces while taking a selfie, we’ve had more bad shots than good ones. Well, with the SQ6‘s Selfie Mode, you never have to worry about wasting your instant films on bad selfies. There is a tiny mirror beside the lens so you can make sure you look good and everything is in frame. The camera will also automatically adjust the settings for optimum brightness and focus for the perfect selfie. What’s even better is that you can attach a tripod and set a timer to the SQ6 for group photos and even self-portraits. Photography buffs will have a wide-angled lens for landscape shots and a prime lens for portraits but we don’t get interchangeable lenses on an instant camera. However, FUJIFILM is offering the next best thing – two different modes for you to shoot close-ups and wideshots so we can capture all our memories on film. The Macro mode allows you to shoot your subjects as close as 30cm while the Landscape Mode allows for long-range shooting from a distance of 2m. In our opinion, the most impressive mode of this camera is the Double Exposure mode. You don’t need phone apps to create double exposure shots anymore. The SQ6 allows you to create artistic overlapping images just by clicking the shutter button twice. The two consecutive images would then be combined on one film and you get yourself a one-of-a-kind image to keep forever. It’s as easy as that. To add to the artistic flare to your shots, coloured filters for the flash are also included so you can create unique tinted images. 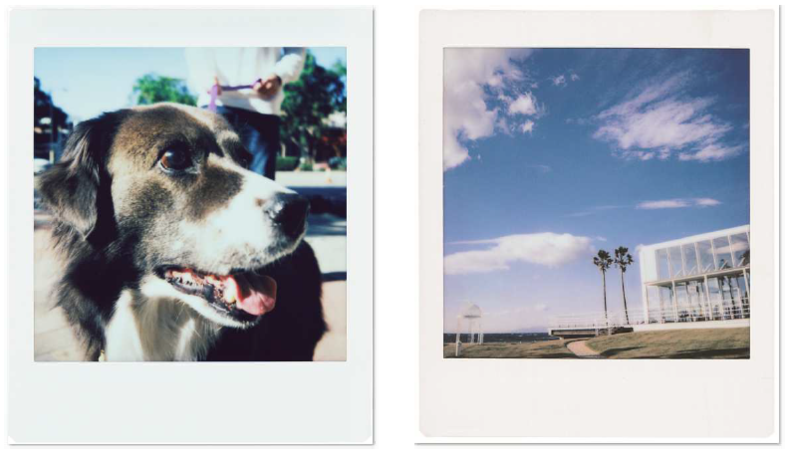 Of course, you can’t have a instax camera that takes square images without square instax films. FUJIFILM already has square instax films available but it has released a new “BLACK” frame square instax film to increase the contrast and vividness of the colours in your images. They also look very chic compared to the regular white ones and we only want to use black frame instax films from now on. The camera is super portable because it’s super light and ultra slim so you can bring it with you anywhere and everywhere! So the most important questions: when can we get it and how much does it cost? You don’t have to wait long! The camera will be available from 25 May and retail for $219. All 3 colours are available but we have a feeling the Pearl White and Blush Gold will be snapped up so you should try to get it ASAP. 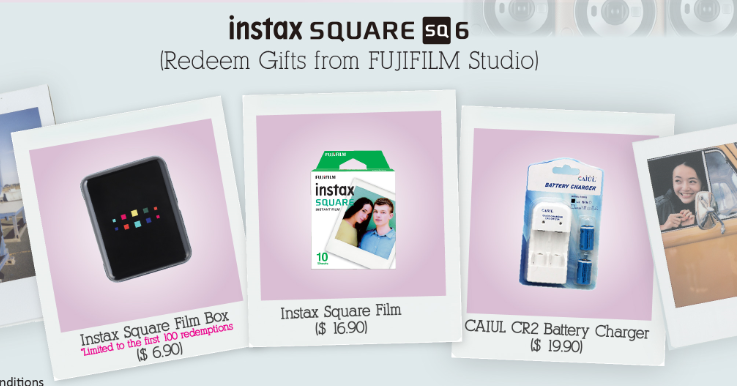 Also, there is an early bird promotion from 25 May to 30 June, where you can redeem up to 3 free gifts (worth $43.70), with every purchase of a FUJIFILM Square SQ6! The FUJIFILM instax Square SQ6 ($219) will be available, from 25 May. The FUJIFILM square formate film “instax SQUARE film” in Black is now available at all FUJIFILM authorised dealers. For more information, visit FUJIFILM’s Facebook page.